Has it been awhile since your last exhaust system cleaning? You could have a fire code violation on your hands. Plus, you may be putting your restaurant at risk of serious damage from a grease fire. At Flue Steam, we have decades of experience in the specialized field of commercial kitchen exhaust cleaning. We know what NFPA code inspectors are looking for and we know how to make them happy. 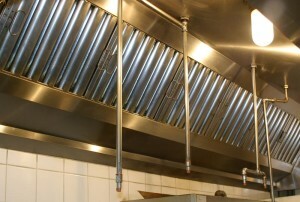 All you have to do is call us now for expert restaurant kitchen exhaust cleaning in Fullerton CA. Depending on the type and amount of food prepared in your restaurant kitchen, you may need cleaning more or less frequently than the average restaurant. Fortunately, our two cleaning methods can be combined to meet any and all cleaning needs. You can get hand scraping every month to remove grease from the areas where it accumulates fastest, and steam cleaning every 3 to 6 months to remove dangerous grease deposits from your entire duct system. Our techs can measure grease depths to help determine how quickly grease accumulates in your kitchen and make sure you are getting restaurant kitchen exhaust cleaning in Fullerton CA before you have a fire hazard on your hands. Exhaust fan inspection: Without a working exhaust fan, hot greasy air will linger in your kitchen. That’s why whenever we provide restaurant kitchen exhaust cleaning in Fullerton CA we also take the time to carefully inspect the exhaust fan and recommend any necessary repairs. Can’t remember the last time you had restaurant kitchen exhaust cleaning in Fullerton CA? It’s time to call Flue Steam. We can have a crew at your restaurant ASAP. Please call 800-700-FLUE now to schedule service.